It's taken phone manufacturers a long, long time to realise that we want decent sound from our handsets - and while a few have begun improving things by offering support for Hi-Res Audio, the files are much bigger, taking up valuable internal space. Thankfully there's another incoming technology that will make your tunes sound even better without munching all the space you need for games and photos. It's called Master Quality Authenticated (MQA), and MQA Ltd claims it's about to revolutionize the way we listen to our music - both at home and on the go. It promises to deliver a sonically superior experience while in a smaller file size so that amazingly high quality audio can be packed into files small enough to easily stream and download. Using the science behind how people hear, the MQA team claims to have created something that captures and delivers the full magic of an original studio performance without any compromises. As an 'end-to-end' technology it means (with the right equipment) you can listen to exactly same sound as the recording engineer and artist crafted in the recording studio. Nothing is lost in the process of shrinking chunky great studio masters into pocket-sized pieces, with your file retaining 100 per cent of the auditory experience witnessed by those who created the thing in the first place. It's the musical equivalent of squeezing an entire afternoon tea into a ring-pull can that you can take home, crack open and eat in your lounge, the carrot cake, scones and clotted cream tasting as soft and fresh as if it they had just been served by a waiter at the Ritz. MQA works by scrubbing clean what's known as temporal blur (timing errors), quantization distortion and computational-induced noise - essentially finding the mistakes and sonic elements your ears can hear well and providing only the correct bits for your brain to decode. MQA head and also the co-founder of Meridian Audio, Bob Stuart also had a major hand in the development of DVD-Audio, another format created to bring an improved sonic experience using burgeoning technology pre-2000. Studio-quality sounds are nothing new, but this is the first time they've been packaged in a small enough size to not eat up huge amounts of storage, a massive problem on portable devices. For example: Haydn's String Quartet in D No 5. In hi-res competitor format DSD is 306MB while the MQA file is just 40MB. This compares with 73MB for the 24-bit/96kHz FLAC file and 142MB for the 24-bit/192kHz version. Extrapolate that figure and you can easily see how many more hi-res tracks you could pack into a 16GB phone if they come in MQA form. One of the clever things about MQA is that it isn't actually a file format itself; meaning it can be packaged into any other types of audio file container, including the popular FLAC and ALAC formats. This means it can be played back on almost any existing playback device without the need for a special MQA decoder, although without them you 'only' get a sound that's equivalent to CD quality. MQA decoders unlock the master quality sound wrapped up inside the carrier file but at least you can play MQA content and hear your tune on any, or all, of your devices (and the file automatically detects the best quality available based on your hardware). So you can easily play a downloaded MQA file on your mobile phone today (although iPhone owners will have to jump through a few hoops unless music providers start offering MQA tracks contained within Apple-friendly files such as ALAC and AAC) but with quality not much better than CD. Where do I get MQA music from? MQA isn't just about hardware, as it requires content to be created by recording artists. As far as content goes, it's still early days but the biggest name so far to sign up is Warner Music Group, which includes Atlantic Records and Parlophone, who represents the likes of Coldplay, David Guetta and Radiohead. We're yet to see (or hear) any MQA music from any of Warner's vast range of artists but the new music format is already available to download from Onkyo Music, e-Onkyo, 7digital and Technics Tracks, whilst Norwegian classical label 2L has already made its entire catalogue available in MQA. If that sounds like a lot of sites to keep track of, we've found Find HD Music to be a useful tool for searching multiple sites for hi-res tracks. It's not the same on every store, but hi-res tracks often command a small to medium price premium over their CD-quality counterparts. On Technics Tracks, the 16-bit/44.1kHz (CD-quality) version of Amy Duncan's Undercurrents is £8.99 (approx $13 or AU$18) where the MQA version (24-bit/44.1kHz) is around 50 per cent more expensive at £14.99 (approx $21 or AU$30). Much closer in price is Mozart's Violin Concertos on 2L, where the 96kHz FLAC version is £13 ($19, AU$26) but the DSD128 and MQA are both £16 ($23, AU$32). 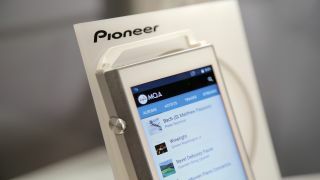 Arguably of even greater significance than the download market, especially for phone users, is the role MQA looks set to play in music streaming services. The fact that MQA isn't a file format, means that Hi-Res Audio can be streamed at more or less the same bit-rate as current CD-quality streams (approx 1.5Mb/sec) - a huge upgrade. Indeed, Jay-Z's Tidal is expected to announce soon that it will offer an MQA tier although, as mentioned, you'll need a device with an MQA decoder inside to access the hi-res version. How do I get an MQA decoder? MQA is still in its infancy and few manufacturers have announced they'll be adopting it. At present it's available on a couple of dedicated Hi-Res Audio players – the Pioneer XDP-100R (£500, $700, AU$719) and Onkyo DP-X1 (£699, $799, AU$839) - plus Bluesound's multi-room component-based system. There's also the Meridian Explorer 2(£199, $299, AU$499), a USB digital-to-analogue converter, to plug into your computer to improve its sound if you don't fancy listening to your powerful tracks at only CD quality. What about smartphones and tablets? Any track bought from the download stores listed above will play in CD-level quality on most smartphones and tablets (except for iPhones / iPads natively). But there are third party solutions for iPhones and iPads in the form of Hi-Res Audio apps such as Onkyo's HF player (£7.99, US$9.99, approx AU$16) which can handle non-Apple formats including FLAC so you can at least hear the music (again in CD quality). Higher-end Android devices from the likes of LG, Sony, HTC and Samsung can already play hi-res FLAC files but none as yet are able to decode MQA (although HTC has publicly demonstrated a prototype phone with MQA decoding). Now that MQA quality tracks are available to download from a variety of providers it seems likely that major mobile device makers will get on board sooner rather than later. There's no DRM (digital rights management) or copy protection preventing you from playing the same MQA file on as many devices as you choose. That's not to say there's no DRM at work though; it does play a role through identifying a digital fingerprint that authenticates the provenance of the track, where it works out if the music was mastered using MQA encoding. All playback devices will be able to flag up whether what you're listening to is simply an MQA version of a legacy track or was MQA mastered at source. The fingerprinting also ensures that you can't be fobbed off with a lower resolution file that's been unsampled and sold as high resolution - for once, a form of DRM protecting the consumer. OK then. How does it sound? Initial tests comparing MQA tracks with standard Hi-Res Audio versions confirm that the smaller sized version is genuine match for the full fat DSD versions and other high end options. We've used the Meridian Explorer 2 and an iMac with some OPPO PM2 (£699, $699, AU$990) planar magnetic audiophile headphones to listen to a selection of mostly classical tracks. You can try it for yourself if you go to 2L's hi-res test bench where you can download (for free) a number of MQA FLAC files including Mozart's Violin concerto in D major by Marianne Thorsen and the Trondheim Solistene. It hasn't made us want to rush out and replace all of our favourite Hi-Res Audio tracks but it's convinced us that in the future if the MQA version is available it'll probably be the one to go for, not least because its size gives us the convenience of being able to play the same quality of tracks across multiple devices. And we're eagerly awaiting the launch of Tidal's MQA streaming service, which will be of much wider relevance to the mobile world. One thing's for sure, the new kid in audio town may be a skinny little fellow but he sure can pack a sonic punch.